5.) Open, stir and eat! Simple! * Water amounts vary depending on the meal as do the wait-times. 1.) Chicken Gumbo is New Orleans style gumbo with okra, chicken and rice. Gluten Free. Location and Weather Conditions: Breckenridge, Colorado. Spruce Creek Loop Trail in the Tenmile range. Snowshoe hike on well-traveled snow pack. Elevation topped out at 11,300 ft (3440 m). Cloudy day with little sunshine, no wind. Temperature at lunchtime was about 54 F (12 C). Performance: When out on the trails, my food-loving hiking companions and I always like to have a hot mid-day meal. No cold sandwiches or food bars for us! On this particular occasion, I was with my husband and we were enjoying a crisp day snowshoeing. Lunch was highly anticipated! Making the Good To-Go Chicken Gumbo was simply a question of boiling water and being patient while the food rehydrated. The hardest part of the prep was tearing the package open! Once the boiling water was poured into the food pouch and the pouch resealed, the wait was about 20 minutes as stated in the directions. I decided to utilize this time and the heat of the package by tucking it under my jacket so it was next to my tummy. Toasty! Bonus! The Gumbo was certainly worth the wait! Nicely spiced - actually VERY spicy but in a good way. The chicken rehydrated fully which as an amateur dehydrator devotee, I can say that is no mean feat. Meat is the most difficult food to dehydrate/rehydrate properly. There was a very ample portion of food. As a matter of fact, I had to force myself to eat the whole thing. It was more than I normally eat at one sitting. Fortunately, it was so good that the sacrifice wasn't all that much of a sacrifice! I definitely did not suffer any hunger pangs again the whole rest of the afternoon though. Recommendation: Absolutely! I would consider splitting it with a buddy. And definitely have a complementary liquid to go with it! Chowing down on the Korma! 2.) Indian Vegetable Korma - Creamy Tomato and Yogurt Braised Vegetable. Gluten Free/Vegetarian. Mostly hard-packed dirt and rocky sections of a hiking/biking and horse-riding trail. Elevation range from 6300 to 6900 ft (160 - 175 m). Partly cloudy with intermittent winds sustained at 3 - 5 mph (5 - 8 kph). Location and Weather Conditions: Railroad Grade Trail, Apache County (near Springerville) AZ. Cinder trail following a historic railroad corridor. Elevation topped out at 9200 ft (2800 m). Beautiful sunshine but with horrible winds - sustained at 5 mph (8 kph), gusts to 15 mph (24 kph). Temperature at 5:00 pm (dinnertime) was about 64 F (18 C). Performance: Trying out the Indian Vegetable Korma, my husband John and I decided to split the package. Since I had two packages (two servings) this meant we could enjoy the taste twice! In each case, the prep, cooking and waiting time was the same as for the Chicken Gumbo. I actually remembered - well, John did - to take out the oxygen absorber first! It was a little hard to get the stove lit with the wind, but once the stove did its thing and the water boiled, we were good to go (no pun intended). As with the Gumbo, I kept the pouch warmer during the wait time by holding it under my jacket. Unfortunately, we were over anxious the first time we made the Korma and the beans were rather hard. I think we shorted the wait time by about 4 minutes. Obviously, that was not a good thing to do. The second serving we waited patiently the full time with much better results. The Korma was very tasty, nicely spiced and even splitting the food, we were satisfied completely. 3.) Oatmeal - Oats with quinoa, chia and hemp hearts. Gluten Free and vegan. This was a very steep trail starting at the top and heading down into the canyon. Hard-packed, well-traveled surface. Elevation ranges from 5638 - 6175 ft (1718 - 1882 m) and the trail is about 3 miles (5 km) round-trip. Nice, calm day with limited sunshine and temperatures in the mid-60s F (18 C). Hardest part of preparing this meal was finding a somewhat level spot on the trail! Performance: Since we were burning up the calories on this trip, we decided to each eat our own package of oatmeal. Directions are the same as for our previously tried dinners except, the oatmeal required 10 oz. (300 ml) of water and only needed 5 minutes to rehydrate. I liked that! I'm not much of a breakfast cereal fan but do occasionally eat oatmeal on a cold winter day. The texture of the oatmeal was very satisfying with some crunch and a very interesting spice mixture from the turmeric and cardamom. I had to read the ingredients to figure out why this wasn't like any other oatmeal I've ever had. While it was tasty and very, very filling, I'll probably stick to my usual home-made dehydrated backpacking breakfasts with eggs, potatoes and sausage! 4.) Granola - whole grain oats, figs, blueberries and almonds with milk. Gluten Free and Vegetarian. 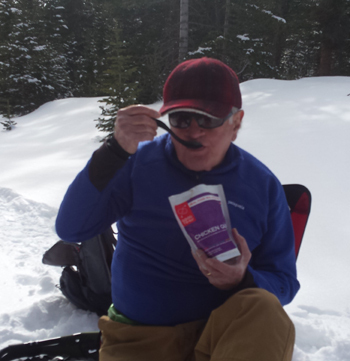 Location and Weather Conditions: I've prepared and eaten the Good To-Go Granola on several occasions in several locations in Colorado, New Mexico and Arizona. Temperatures were anywhere from 35 F to 75 F (1.7 to 29 C). Trails were generally hard-packed dirt and rocky but established except for a couple of "bushwhacking" hikes in the BLM land adjacent to our home. Performance: Preparing the Granola is probably the simplest of all the Good To-Go products that I've tried. Hot or cold water can be used - and I've tried it both ways. Only 4 oz (100 ml) is necessary and there is no wait time to deal with before chowing down. This is great when I'm hungry! I simply add the water, stir and eat. I really, really love the taste of this Granola! It's very tasty - sweet but not too sweet and there is a variety of textures to enjoy with crunch and chewy bits throughout. Figs, blueberries and almond galore! It does pack a hefty portion of calories though - 580 - so, hubby and I have always split the package when we eat it. Because - I suspect - so little water is used, I really didn't find any difference in making the Granola with hot versus cold water. The water is very quickly absorbed and by the time, I stir the contents completely, well, the water isn't hot anymore anyway. The manufacturer doesn't advocate this, but accidentally, I found out that the Granola will keep in its original pouch for a couple of days after being rehydrated and will taste fine without any undue after effects! Bonus - the fruit was even chewier than initially! My husband and I really like this Granola and have added it to our backpacking shopping list! 1.) Tasty! Just the right amount of spices. 1.) Mixing and eating from bag is a bit awkward. 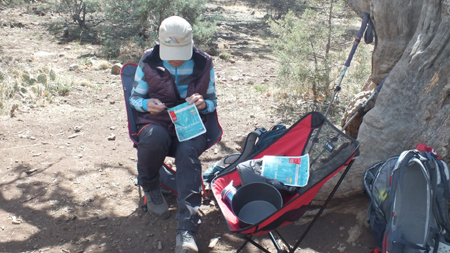 Since I'm a big fan of hot food on the trail, my trailmates and I almost always tote along a stove and the fixings for a hearty hot meal when we are going to be outdoors for several hours. Mostly, I'm not a big fan of commercial packaged meals. They are usually very high in sodium and really don't taste all that different, no matter the manufacturer or what the label on the package is. Lastly, commercial meals are rather pricey! So, my daughter-in-law and I make all our own dehydrated backpacking grub. And because of our experience, I know how much work goes into producing flavorful, nutritious meals. The Good To-Go meals are the best commercial products I've ever eaten and well-worth the price and I can unequivocally recommend them. Thank you, Good To-Go for creating these stellar recipes! This report was created with the BackpackGearTest.org Report Writer Version 1.5 Copyright 2018. All rights reserved.